Four local area DC Developers (Doug, Gabe, Jason, and Min) got together and created two excellent Twitter mashups that were released this week. Twittertale.com weeds out public tweets that have swear words and then highlights them on their school room inspired site. It also keeps track of the top 5 naughty words as well as the users who indulge in the most sailor talk. As of this posting, @bumblebunny looks to be an interesting person to follow. As an extra twist, I think the swear words should be censored with *’s leaving the audience to guess what swear words were being used. 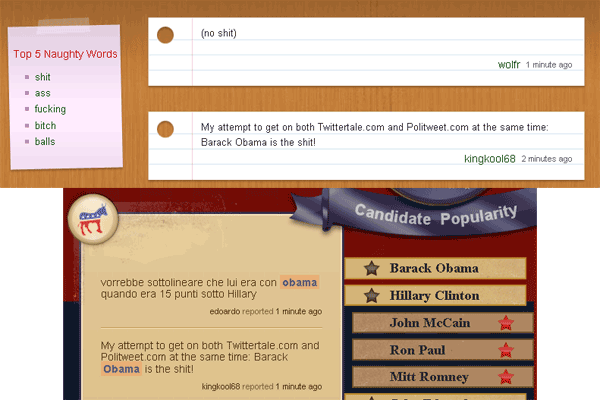 Politweets.com takes the same concept from Twittertale but applied to U.S. Presidential candidates. The two major political parties are seperated out and the political candidates are ranked in the middle based on the number of mentions on Twitter. This is a neat way to extract data from such a large body of political commentary and the guys certainly nailed the design with a gorgeous yet simple layout. Thanks for the post Russell, we had a lot of fun making them and are really overwhelmed by the response both sites have gotten. We appreciate the kind words.